After hiking the mountain, we went back to the hotel to rest a bit. You know, we are both grandparents. As a rule, grandparents need a nap after vigorous activity. I would consider going up and down the mountain as vigorous activity. If I sweat just a little bit, that, in my dictionary, is vigorous activity. So we were content when Crystal mentioned that she was going to drop us off back to the hotel. On the way back, since we did not have any more scheduled activities on our itinerary, Crystal asked us if we would like to see a performance of ballet or acrobats of some sort? We nodded our head (yes, we were that exhausted… we couldn’t even talk… ha ha). So Crystal picked up her cell phone and started dialing. Then she turned around from her seat and asked us, which seat do you prefer? Not so good, good, or very good seat? Hubby contemplated and said let’s choose the middle one, so the good one. Then she went back to her phone, and later told us the ticket would cost us 200 Yuan each. So we went back to the hotel, rested, had dinner and were ready to be picked up by Crystal by 7:30 PM. At the beginning I wasn’t sure, because we are early birds. We go to bed when chickens go to bed. So having to come out of the hotel at 7:30 at night means we won’t be in bed by 9. But I didn’t fret. Surely if the performance was boring, we were allowed to take naps. After all, we are grandparents right? We drove through Guilin at night, and it only took us about 10 – 15 minutes to get to the theater. When I got out of the car, the first thing I saw was many large tourist buses. And I was thinking, oh great, it is going to be very crowded. We walked through the parking lot, and there were several steps leading up to the front door of the theater. Like any other theater, this building has a sign indicating its name on the top of the building, with colorful lights. And no, at the time I didn’t think of taking a picture of the sign. As we waited for Crystal to get our tickets, we stood by the front door, while other tourists were walking by. There were two female in white shirts with red vests guarding the door. Meanwhile, down in the parking lot, more buses were coming and tourists were spewing out of the busses. While we waited, attendants were helping people find their seats. Tourists started to fill in all of the seats; the hum of conversation floated in the air. You could hear all kinds of language around you. Chinese, Cantonese, even Indonesian! One young girl, [probably early 20s] sat beside me, and boy, she just would not sit still!! She kept bouncing on her seat and kept moving around. Grrr….. Oh… I have gotten grouchy in my old age! The seats behind us started filling up too. People were talking everywhere, until there was an announcement that no flash photography or video graphing allowed. What a bummer!! But, I understood that the performers needed to be able to concentrate, as well as not disturbing the other theater goers. Imagine flash popping out everywhere in that big theater. That would not be enjoyable. So I just tucked my camera away and pouted. Ha … Just kidding. The lights were turned off, and the projector behind us started working. The screen in front of us started filling itself with scroll of texts of story line and thanks to Cindy, I remember again most of the performance details. You know, you remember you have seen something, but if someone asked you about it, you couldn’t really describe it. Cindy pretty much described all of the performance and helped me remember a lot of things. Some of the performance highlights to me were ten boys performance with hats. They juggled with several hats, and in the last portion of their performance, one boy was juggling ten hats. He threw ten hats into the air in front of him one by one, while running, and as the first hat descending, he caught it, threw it again to the air, and did the same with the second and next hats. He ended up running in a circle at the stage, and these ten hats flying in front of him. It was really neat and I thought juggling three balls was hard!! I liked the one with a girl hanging from the ceiling with a long, pastel cloth, where there was a young man holding both ends of the cloth. Then he swung the cloth, which made the girl flying on top of the stage. It was such a pretty performance. There was a girl climbing up wooden chairs stacked on top of each other, where she stacked the chairs herself, as she climbed up. Then, after she put up about 6 or 8 chairs, she was balancing with her two hands or just one hand, on the top of this wobbly looking structure. Then, she tossed one chair to the side, and landed to the next chair with her two hands, and repeated the motion until she came back down to the stage. I was afraid for her, although I am sure she knew what she was doing. There was a rope from the ceiling that she pulled and hooked onto her back as she stacked up all of the chairs, but to me, it was only holding her costume. It wasn’t like she was wearing a belt that for sure would hold her up if a mishap happened. Then there was a group of young men performing acrobatics involving several metal rings. Each metal ring consisted of two rings, one was smaller than the other one, and the two rings were connected by four or five metal bars. The rings were large enough for a man (small man) to hold the inner ring with both arms and legs spread out. They went round around the stage with the rings, sometimes several people were in and out of the ring, and sometimes it was hold just by one person, with the ring itself rolling on the stage. This was where I saw they made an error, or at least, the apparatus they used broke. I saw one of the inner or outer rings come apart, but the performer made it up by holding it up with his hand and kept on rolling. So that makes me wonders if they were not a metal ring, but made by other material. The other performance was two little girls, very tiny little girls doing contortions on top of a giant vase. Also, one of them was holding candles with both of her feet, hands, forehead, as well as her mouth. I was just amazed how limber they were! It was a beautiful performance, and I really enjoyed it. There were also laser light shows during the whole performance. Although I have never seen a Cirque de Soleil show, this performance reminds me of CDS. It was worth the money and time to watch this show, I might add. I might even watch it again, if circumstance permits. The only downside that I experienced was the other tourists, who insisted of taking pictures with flashes, which was very disturbing. Also, people who insisted to talk, and very oblivious that the others would want to see the performance and not want to hear them talk! At the end of, when all was said and done, the audience walked toward the exit door, and there it was. The whole ensemble was standing up in the front lobby, ready to take pictures with the audience. They were still in their last costume, bathed in bright hall lights. Silly us, we were in a hurry, trying to get out and did not take any pictures. Grr… that’s why I want to go back and watch them again. One of the sites I found online, I don’t know if I can find it again, mentioned that each of the performers was holding a CD or DVD of the performance. That the CD/DVD is available for sale. I’m not sure if that is true or not. This gig was produced by China Heaven Creation. Apparently, CHC also produces other shows! So, I can imagine they would incorporate other shows with other tourist places in China. I guess we will do more research if and when we go back to China again. Lastly, during my research, I found there are other tourists who have seen this show, and somehow they have pictures as well. There is this mR.Son.Photostream that uploaded his/her pictures into flickr; the pictures look professionally taken. One photo by kk_wpg and the rest of them were blog posts by Marathon Man, Wong Chun Xing, M-Knight, and tepikampung. I also found a couple of video clips here and here. So enjoy! 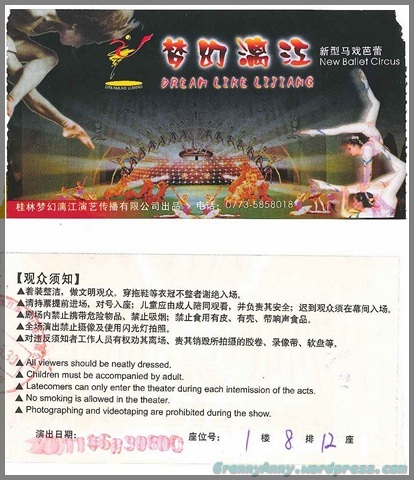 If you stop by Guilin, be sure to watch this show if you have the time. Until my next post, Li River cruise! « Longji Terrace Rice Fields Part 2.